Woodland Grey now a standard roller shutter colour! Some exiting news in the Adelaide new roller shutter industry: we can now supply & install Woodland Grey domestic roller shutters as a standard colour! This includes the top box, side guides and bottom bar; the whole shutter can be done in Woodland Grey at no extra cost (previously powder-coating charges would apply). It’s always fantastic to see the roller shutter standard ranges extended – the demand is certainly there as Woodland Grey seems to be the go-to colour of the moment – it’s great to be able to match your shutter colour with surrounding features for a seamless look. What do you think? 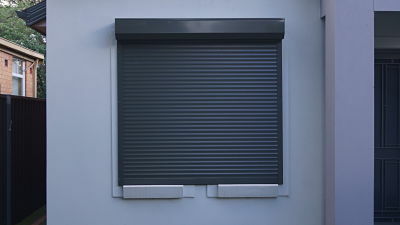 Are you in the market for new roller shutters – and would you consider the boldness of a darker shutter shade? Give us a call on 84473443 for advice on roller shutter colour schemes, as well as any other roller shutter related queries you may have – we’re happy to help! 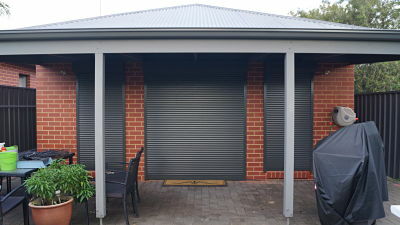 This entry was posted in We heart Roller Shutters. Bookmark the permalink.